It is no secret that in modern-day industrial applications, efficiency and precision are becoming absolute necessities regarding motor control. Variable Frequency Drives (VFD’s) have become widely accepted as an excellent means by which companies can facilitate these needs. However, precision motor control within hazardous environments has presented problems for years. Until now, options have been hampered by the need for compressed air, high installation costs, and a lack of locational flexibility. Fortunately, a new solution has been developed to make these problems a thing of the past. 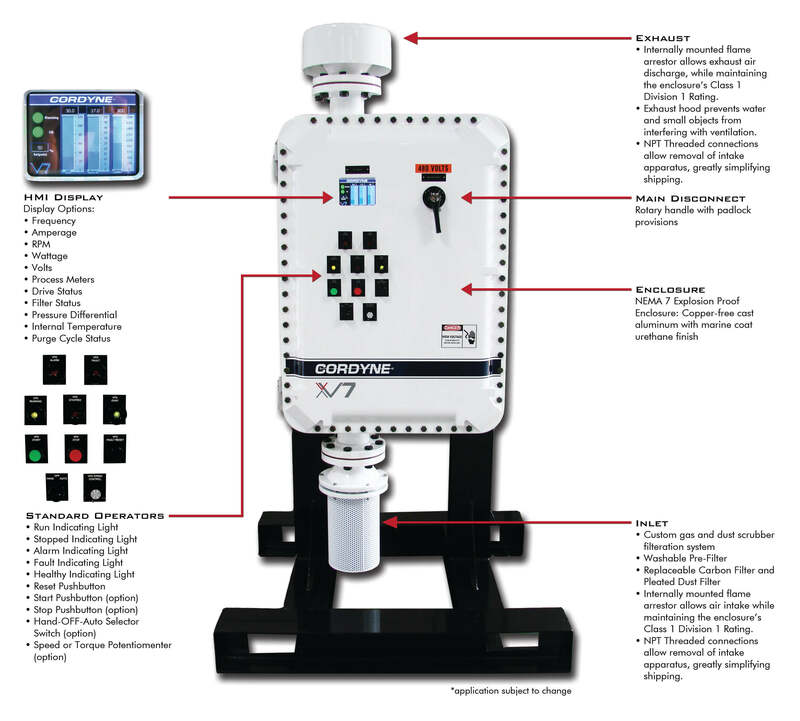 Cordyne is proud to offer our state-of-the-art XV7 Series. By encapsulating a VFD in a NEMA 7 explosion-proof enclosure, we are able to create a safe area in which the VFD is not at risk of igniting the surrounding atmosphere. The key to this ground-breaking design lies within the ventilation system. Cordyne’s proprietary design allows ventilation to be achieved, but should an explosion occur within the panel, flames will not escape and ignite the surrounding atmosphere. In addition to the numerous benefits that a VFD imparts on a motor (precise control, increased efficiency, and longer life expectancy), Cordyne’s XV7 Series brings a number of operational benefits to the table. Wire and conduit from the drive to the motor are greatly reduced, reducing installation time and cost. New air hoses do not need to be run, reducing installation time and cost. Compressor downtime translates to drive downtime. Elimination of the compressor means elimination of its downtime, reducing the total downtime of the drive.